The workbook was used during the Amos Parrish Fashion Merchandising Clinic, held in New York City, January 6-10, 1930. It belonged to Howard Phillips, merchandise manager for the Ernst Kern Department Store, Detroit, Michigan, and has been heavily annotated by Phillips during his week at Parrish's clinic. The Amos Parrish Fashion Merchandising Clinic was offered once and sometimes twice annually from the 1920s through 1955 to forecast the year's trends for the fashion industry. 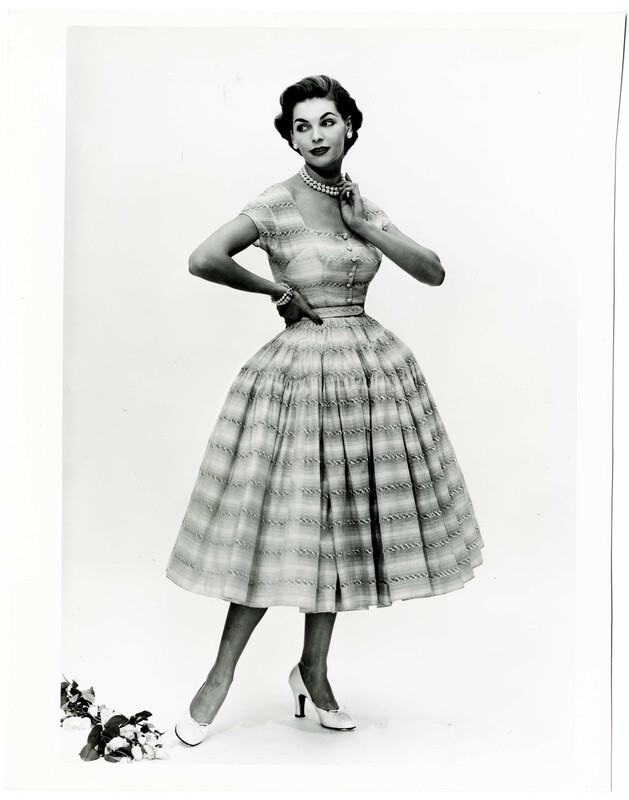 Dan Arje (1923-1993) was a designer and display director for Bonwit Teller. The collection is primarily comprised of albums containing photographs and news clippings about Arje's displays, as well as correspondence regarding his decorating work for the White House during the Kennedy and Johnson administrations, including the decoration of the White House Christmas tree. Also present are materials Arje collected about Bonwit Teller and Tiffany's designer Gene Moore. Contains printed and moving image publicity materials produced for late 20th century fashion designers. Predominant designers include: Calvin Klein, Donna Karan (DKNY), Joseph Abboud, Pierre Balmain, Ralph Lauren, and Tommy Hilfiger. Also contains printed materials produced for Parsons' alumni Anna Sui, Badgley Mischka, Isaac Mizrahi, Marc Jacobs, Narcisco Rodriguez, Peter Speliopoulus, and Bruce (Daphne Gutierrez and Nicole Noselli). Consists of 19 scrapbooks containing more than 10,000 prints of fashion illustrations produced between 1805 and 1913. The prints primarily depict men's, women's, and children's clothing and accessories, with a small number of images depicting theatrical costumes, architectural and sculptural details, and textile designs. One scrapbook contains swatches of French and Asian textiles. Many of the images were issued originally as portfolio prints, others cut from books and periodicals, such as Graham's Magazine and Godey's Lady's Book and Magazine. The majority of the earlier prints are French. Saks Fifth Avenue compiled this collection of over 1,000 slides depicting fashion runway shows during the 1990s. The 35 mm slides depict haute couture and ready-to-wear collections from an international array of fashion designers and houses, including Oscar de la Renta, Donna Karan, Issey Miyake, Rifat Ozbek, Max Mara, Yves Saint-Laurent, Versace, and Vivienne Westwood. Dan and Corina Lecca, Chris Moore, and Dino Scrimali are some of the photographers whose work is represented in the collection. Manuscript created by Parsons instructor Estelle Hamburger for the book, Fashion Business: It’s All Yours (Canfield Press, 1976). After graduating from Parsons in 1945, Margaret Hodge became director of fashion marketing at Vogue, and in 1967 established her own fashion publicity business. Hodge led multiple marketing campaigns, tying clothing lines to the style and fashion of Hollywood films. The collection largely consists of examples of promotional material from Hollywood films, including publicity, set and costume design photographs, press kits, event announcements and tear sheets. The bulk of the material was produced between 1962 and 1976. Consists of eight issues of a magazine produced for the staff and associates of Saks Fifth Avenue. There are four issues of Saks News, 1952-1953; and four issues of Saks Fifth Avenue News, 1969, 1974, 1976. The 1969 issue honors Adam Gimbel, long-time President of Saks, upon his retirement. The collection is comprised of 75 binders of fashion photographs promoting Saks’ clothing lines, including Sophie Gimbel Originals, ready-to-wear, and custom collections from 1954-1967. These photographs and reproductions of fashion sketch sheets display the development and progression of Saks designers’ collections.